Food Nutrition Facts - stay healthy AND slim with healthy foods to eat! Food nutrition facts are grounded in sound science and nutrition research. The good news is that the FDA now requires food companies to label calories, fat, fiber, sodium, cholesterol, sugar, carbohydrates, vitamins and minerals. Look for high fiber, low sodium and low sugar content. This is helpful but is it the whole story? No! It makes sense that GMOs be labeled so we know whether or not we are buying genetically modified food. No long term studies have been done on the affects of eating genetically modified food over time. At least the consumer should be given a choice of whether or not we want to take our chances that these foods are truly harmless. This will not happen unless we demand it. We want healthy foods to eat and instead we are bombarded with advertisements for highly refined processed foods loaded with sugar and salt. They are addictive and completely irresistible and the ads are very effective. So we need the scientists to help engineer healthier foods that are sold as snacks. And then there are some food nutrition facts that are often all over the media that are just plain wrong. 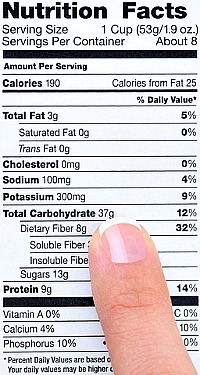 The truth is nutrition facts are often manipulated to serve the needs of the food processing industry. They become food fads as the mainstream press picks up on the latest so called health edict coming from some paid-for-by-industry researcher. Sometimes food nutrition facts get boiled down to very simple pronouncements that people remember that do not serve them well. Remember when we were told that butter and eggs caused high cholesterol? While it is true that animal fats, the saturated fats can be high in cholesterol it's important to limit them not do away with the healthy ones. Sadly, many people started eating hydrogenated fats like margarine and stopped eating any eggs! Hydrogenated fats are not good for you in any amount. Far better to limit real butter to a teaspoon or two a day and eat eggs but just not every day. Eggs are the cheapest protein you can buy and an excellent source if you eat them in moderation. If you have high cholesterol consult with your doctor and stick to the plant fats in moderation, olive oil and coconut oil for cooking. Because technology and industrialization have led to enormous changes in the way we eat, chronic illness including obesity have become endemic to our culture. Too many people are no longer aware of these basic food nutrition facts and how they impact health. The culinary traditions of our ancestors and the way people ate for thousands of years has changed radically beginning in the 20th century. Fast food restaurants, convenience foods, shelf stable foods, fake food, foods with dyes, hormones, and chemical preservatives are abundantly available all over the world now. If the rest of the world moves towards how America eats they will soon be as obese as we are – 1/3 of our population! So how can we eat real, living food in this modern world that still has the nutrients in it that will nourish us in the way human beings were intended to be nourished for thousands of years? As food, nutrition writer Michael Pollen says, " Eat real food. Eat mostly plants. Not too much." In today's world too often people are served huge portions and restaurants serve double what one person needs. Not too much means standard portion sizes of our parents' era. There is extensive research that has been done looking at the diets of more traditional, non-industrialized cultures and comparing their health to ours. * This research corroborates what I have learned in my own life long quest and passion for good health which includes low glycemic eating. Food nutrition facts tell us that we need to eat real foods to be healthy and avoid disease. These are foods that lower blood sugar, are nutrient dense and full of fiber and healthy fats. We need the vitamins, minerals, essential fatty acids and phytochemicals that are in fruits and vegetables. We need 8 - 10 servings of vegetables and fruit every day, 1 - 2 servings of whole grains, 1 - 2 servings of protein (dairy products, meat, fish, poultry, eggs,) 1 - 2 servings of raw nuts, seeds and legumes and 20% - 30% good fats. The food nutrition facts that guide you to healthy foods come from traditional cultures all over the world. These are the foods that will help you to be super healthy, slim, active and living at your lifetime fat loss goal weight. Eat whole, unprocessed, food in it’s natural state. Eat animal foods that have been allowed to range and graze and have not been treated with hormones or antibiotics. That includes eggs from free range chickens! Eat only unrefined oils and fats, real butter, olive oil, flaxseed oil or coconut oil. 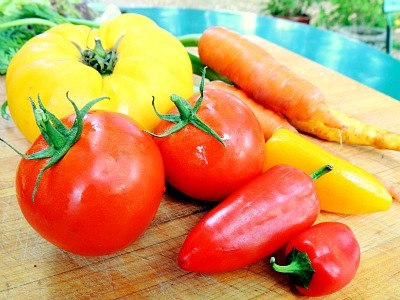 Eat lots of fresh vegetables and fruits, locally grown if possible and organic if possible. If you can’t buy them organic, wash them with 2 quarts of water to which a teaspoon of food grade hydrogen peroxide has been added to remove the pesticides. Eat 100% whole grains and sprouted grains. Eat lots of high fiber beans and plenty of raw nuts and seeds which are high in omega 3 fatty acids. Eat fermented vegetables if you can find them (or make your own) which are great for your digestion and elimination and contain lots of nutrients. Good elimination is essential for weight management and good health. Drink lots of filtered water. Drink water before a meal and you will eat less. Drink lots of water if you aren’t feeling well to eliminate toxins. Food nutrition facts would have us use unrefined sea salt and lots of dried and fresh herbs and spices for seasonings. Use only low glycemic, natural sweeteners, like coconut sugar, agave syrup, stevia, xylitol or erythritol. Use only whole food, natural (not synthetic) supplements, not in place of food but to supplement your optimum diet. Cook only in stainless steel, cast iron, glass or good quality enamel. Food nutrition facts can mean "food" for the soul. Positive thoughts nourish your body and keep you focused on your fat loss goals. Replace fear, doubt and uncertainty with thoughts of peace, faith in the good, love, compassion, joy and abundance for all. Love your body as it is and be grateful that it is getting slimmer every day as you eat according to these food nutrition facts. Nutritional deficiencies lead to weight gain. Real foods contain an abundance of the essential nutrients listed below and will help you to avoid obesity, heart disease, cancer, arthritis, diabetes, multiple sclerosis, chronic fatigue, hyperactivity, depression, dyslexia - you name it! These are the nutrients we need each day. Food nutrition facts cover the multitude of nutrients that are necessary for the metabolic processing of food, the source of your energy and for every single function of your body from your brain to your ability to prevent illness. You can either use food for energy as fuel or store it as fat. Food nutrition facts are the key to weight loss. Permanent, lifetime fat loss requires a well nourished body that is able to metabolize food properly and perform all it's functions from digestion to elimination. Unfortunately the various commercial food lobbies have far too much influence in nutritional and even academic circles which fund the research. To be blunt what is reported in the popular press and even by some dieticians is often dictated more by commercial interests than true health. For more articles on how nutrition can benefit you and help you to manage your weight scroll down! The top juicing recipes to regenerate and transform your body! If you are seriously overweight you need to consider adding flaxseed oil to your daily eating plan. This is the most essential tool you can have to restore the metabolic capacity of your cells. To juice every day you need the most efficient and powerful blender you can get and one that is super easy to clean. Disease can occur in a body that doesn't get enough alkaline foods. Obesity is one of those diseases. When your body is getting all the nutrients it needs, including vitamins and minerals, it's far easier to lose fat! Stressed bodies need more nutrients. Polysaccharides are the super sugars that support optimal health not wreck havoc on your blood sugar. Hormones have a huge impact on your ability to lose fat and be healthy! Do not mess around with diet gimmicks or pills that destroy proper hormone balance. These are the proven fat burning foods including what you need to know about nettles and inflammation. Your liver is your body's chief detoxifier. Your fat cells are loaded with toxins which need to be detoxed! If you want to lose fat you must eat more vegetables! Do you have any idea how these plant foods prevent and reverse disease? Obesity is a disease. If you want to lose fat, snack on low glycemic fruits instead of sweets and high glycemic, commercial snack foods! If you want to program your body to release fat, eat REAL FOOD! The anti-cancer diet prevents cancer and obesity! There are considerable nutritional benefits in drinking coffee regularly when you know what to buy. This is the most efficient and the fastest way to lose fat and stay healthy. Return from Food Nutrition Facts to Lifetime Fat Loss home page.